The Kuwaiti Emir Sabah al-Ahmad al-Jaber al-Sabah has stressed the country’s continued support for the Palestinian cause, particularly the nation’s Marches of Return near Gaza border with Israel. 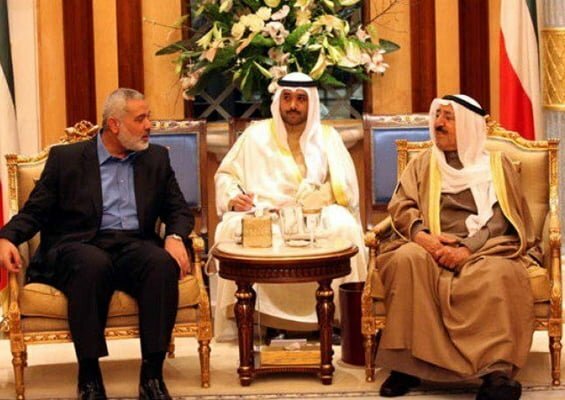 “The Palestine issue is the issue of the government and nation of Kuwait,” Sheikh Sabah said in a Wednesday phone conversation with Head of the Political Bureau of Hamas Movement Ismail Haniyeh. “Any harm to you will harm the Kuwaiti nation and what’s important for you is important for us and we will support the return marches till the end,” he said, according to a report by Al-Alam News Network. The Kuwaiti emir said people across the world stand by the Palestinian nation and support its rights. He expressed hope that God willing, the Palestinian nation will manage to overcome challenges and achieve victory over the Israeli aggressors. Haniyeh, for his part, thanked the Kuwaiti government for supporting Palestinians in the United Nations Security Council and other international forums. The Palestinian official said the nation will continue its tireless efforts to secure the right of return of Palestinian refugees and will work to remove the Israeli-imposed blockade of Gaza. On March 30, Palestinians marched to the fence separating Gaza from the occupied territories at the start of a six-week protest, demanding the right to return for those driven out of their homeland. The demonstrations turned violent after Israeli forces used tear gas and live fire against the protesters. At least 30 Palestinians were killed in the clashes, according to Gaza’s Health Ministry. The violence further escalated on May 14, when at least 65 Palestinians were killed and more than 2,700 others wounded by Israeli fire along the fence between the Gaza Strip and the occupied territories on the eve of the 70th anniversary of the creation of the Israeli regime.